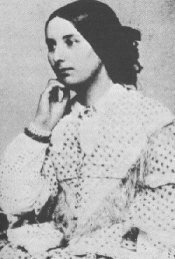 Fanny Brawne (1800-1865) was first Keats’s neighbor and later his fiancée. The eldest child of a widowed mother, she at first perplexed and exasperated the poet. They fell in love, though Keats’s friends were against the match. Keats’s letters to Fanny Brawne are among the most famous love letters ever written. As next door neighbors, they exchanged numerous short notes, and occasionally more passionate ones. None of Fanny’s letters to Keats survive. From his, however, it seems he was often unsettled by her behavior and uncertain of her affection. His illness brought them closer; when he left for Rome, they were engaged and deeply in love. On awakening from my three days dream (“I cry to dream again”) I find one and another astonish’d at my idleness and thoughtlessness – I was miserable last night – the morning is always restorative – I must be busy, or try to be so. I have several things to speak to you of tomorrow morning. Mrs Dilke I should think will tell you that I purpose living at Hampstead – I must impose chains upon myself – I shall be able to do nothing – I sho[ u ]ld like to cast the die for Love or death – I have no Patience with any thing else – if you ever intend to be cruel to me as you say in jest now but perhaps may sometimes be in earnest be so now and I will – my mind is in a tremble, I cannot tell what I am writing. Notes: Keats quotes from Shakespeare’s The Tempest.